The woman is accused of setting a shack alight in the Marlboro South Industrial area, resulting in the death of four people. A 34-year-old woman was served four life imprisonment sentences at the High Court in Johannesburg on January 25. 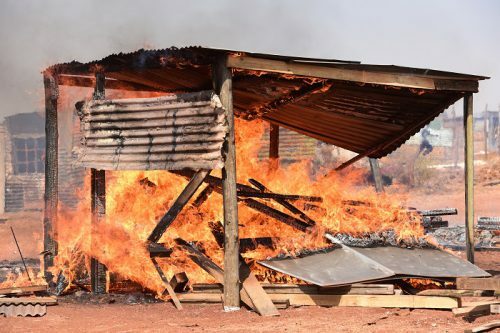 This comes after four people died when a makeshift building at Marlboro South Industrial area was set alight by the woman, reports North Eastern Tribune. According to the spokesperson for the Bramley police station, Captain Molefe Mogodi, the woman set fire to the makeshift building in the middle of the night on April 6 last year. Mogodi explained there were people in the shack at the time, and four of them died as the shack was burning. Mogodi explained that the matter was then assigned to Bramley detectives for investigation. “The investigation led the detectives to a woman who was responsible for causing the fire. It was found that the accused was trying to get rid of the other woman whom she accused of being in love with her man. Count 5: Murder, life imprisonment. The court ruled that counts 1, 3, 4, and 5 will run concurrently with count 2.